Donegal Gathering: Sea Sessions, in association with Heineken, is hitting the road. Sea Sessions, in association with Heineken, is hitting the road. The past four years has seen this surf music festival grow and develop a great line-up of music, action sports and the best beach party with a chilled surf inspired vibe. This April/May will, for the first time see the event hit the road to bring the party, tunes and this ‘surf contest’ to cities and surf towns around Ireland. The tour will kick off in Galway’s Roisin Dubh on Friday April 13th, with Crazy P before heading north to The Black Box in Belfast (April 21st), and a performance from Fujiya & Miyagi. The May bank holiday weekend will see two events deep in the roots of Irish surfing in the surfer town of Lahinch, and the rebel county. 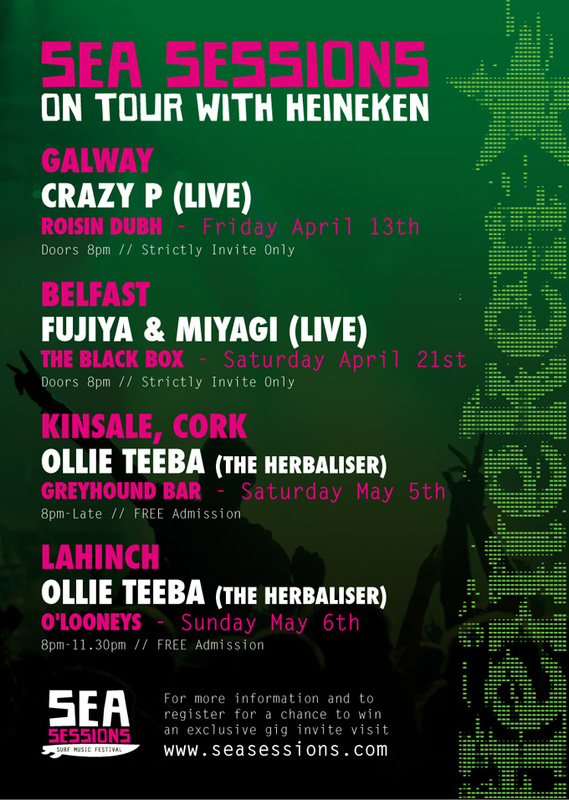 Ollie Teeba (half of production duo The Herbaliser) will take to the stage at The Market Bar in Kinsale on Saturday 5th May and O’Looneys in Lahinch the following night. Surfing is the heart and soul of Sea Sessions and the festival will be hosting surfing contests in Cork and Lahinch (wave dependent). The surf tour events will have a number of categories from short board to long board, with a prize pot of €500 for each event up for grabs. 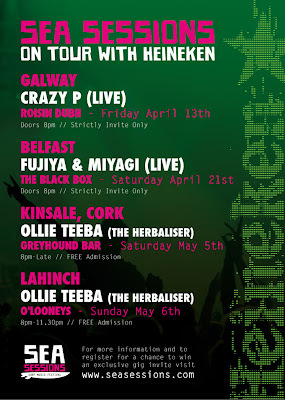 The ‘venue take over’ will see Sea Sessions ticket giveaways, surf gear giveaways and a Heineken in everyone’s hand! Weekend tickets for Sea Sessions 2012 are available now priced €88.50. Day tickets for Friday, Saturday or Sunday are available from all HMV Stores Nationwide. Camping, self-catering accommodation, B&B’s and hotels are readily available in the surrounding area of Bundoran and along the west coast of Co. Donegal.